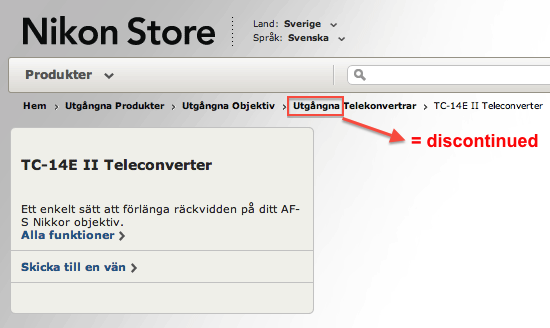 A reader alerted me that the Nikon TC-14E II teleconverter is listed as discontinued at the official Nikon Sweden online store (utgången means discontinued). This could just be a mistake or a local decision, but it could also be an indication that Nikon is planning to refresh their teleconverter(s) for the Winter Olympics in Sochi (February 2014). Coincidentally, the TC-14E II teleconverter is currently backordered at Adorama and B&H (only limited stock at Amazon). Flashback: the TC-20E III converter was announced right before the 2010 Vancouver Olympic games.